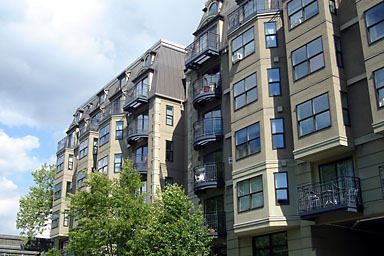 The Montreux is a quaint, European inspired, little complex on the northern edge of Belltown. Located at the corner of Vine & 5th Avenue, it’s close to many amenities including restaurants, grocery stores, Uptown Espresso, bakeries, and of course, the Seattle Center. Most of the units are smallish studios and 1-bedrooms. Many of the studios are less than 350 square feet so it makes for some cozy living. But, they are very affordable and would be great for a single person or someone wanting an in-city pied-a-terre. Where else in Belltown will you find a home for less than $200,000? Other building amenities include a rooftop deck with spectacular 360-degree views, fitness center and a business center. View Montreux condo units for sale.